The benefits of regular exercise are nearly endless. Getting exercise and getting or staying fit helps both your mind and body, and will allow you to perform your duties at a much higher level. Truck drivers are obviously more susceptible to weight problems and other health issues that result from a lifestyle that requires sitting in one place for extended periods of time. You should always couple your exercise routine with a proper diet. Regular exercise helps combat weight control and certain conditions and diseases like heart disease, high blood pressure, and "bad" cholesterol. Studies show that the risk of "all-cause" death is 30% lower in adults who perform at least some regular, physical activity. Any vigorous physical activity is beneficial to your longevity, both as a driver and as a human being. Generally, if it raises your heart rate and makes you sweat, it's exercise. As always, check with your doctor before starting any type of fitness program. Generally, for the average over-the-road (OTR) driver, you will be better off coming up with ways to get exercise on your own, rather than try to find a gym or fitness center. How Does Exercise Affect The Mind & Body? Probably the easiest and simplest type of exercise that you can engage in on the road. You got two legs? Use them. Weight loss: A 30 minute walk will burn 200-300 calories, also helping metabolism and digestion. Longer life: People who get regular exercise in their 50's and 60's are 35% less likely to die in the next 8 years. Increased muscle strength: Helps to strengthen leg and abdominal muscles. Strengthens bones: Can help stop bone loss, reduce risk of future hip fractures and issues. Improved sleep: Helps calm insomnia-inducing stress, helping you to get calm, improved, sleep. Supports joints: Improves arthritis issues, joint stiffness, and other bone-related problems like osteoarthritis. Better mood: Reduces stress and tension, and keeps your mind refreshed. Increased immunity: Helps your body fight against sickness and disease. Boosts energy level: Naturally boosts energy, increases circulation and oxygen supply, aids in proper digestion. Improved circulation: Helps lower blood pressure, increase heart rate, and lower the risk of stroke. Helps prevent disease: Helps ward off high blood pressure, Alzheimer's, arthritis, cancer, dementia, and on and on. Better breathing: Increased breath rate while walking helps oxygen travel through blood streams at a faster rate, eliminating waste and giving you increased energy. Besides walking (or running) laps around your truck, the sheer size of many truck stop and terminal facilities gives you plenty of room to get a long walk in, without having to leave the premises. If you are walking/running/exploring unfamiliar areas, as always, use regular caution and common sense. Try to stay in well-lit, and well-marked paths, keep your head on a swivel, etc. At this point, a good majority of drivers will be carrying a phone with a GPS built in, so finding your way has never been easier. For those interested in more of a strength-training approach to fitness, the tried-and-true method of push-ups, pull-ups, squats, and lunges can be performed with enough variations and levels of difficulty that you will literally never run out of milestones to conquer. There are many different programs and apps available for bodyweight training, and most exercises involve some form of pushing, pulling, or squatting, most of which can be adapted to whatever equipment is available. Namely your truck and the area surrounding it. Working out as a truck driver on the road doesn't need to be expensive. The Healthy Trucker brings you a set of exercises we've specifically designed for truck drivers using minimal equipment. The movements are tailored for truck drivers and target multiple muscle groups at once for efficiency, so you don't have to spend as much time working out. Obviously, the small dimensions of the typical cab limit what kinds of things you can take on the road. There are some smaller items that will help you get exercise in the event that you can't, or don't want to, leave the comfort of your truck. Compact and easy to store, dumbbells would be used primarily for weight and strength training, normally working one side at a time. Workouts are usually performed as repetitions done in sets of lifting, squatting, or swinging. Kettlebells are another popular option for truck drivers, as they are small and compact, and also versatile. A kettle bell is basically just a cast-iron ball (resembling a cannon ball) with a handle attached, and comes in various weights. Initially developed in Russia as a way to weigh crops, they were eventually adapted into use for weight lifting and fitness by Dr. Vladislav Krayevsky, considered one of the most important pioneers of fitness in the late 1800's and early 1900's. Kettlebell exercises also typically involve sets in combinations of lifting, swinging, and squatting, and come in weights varying from 15 lb. to 45 lb. 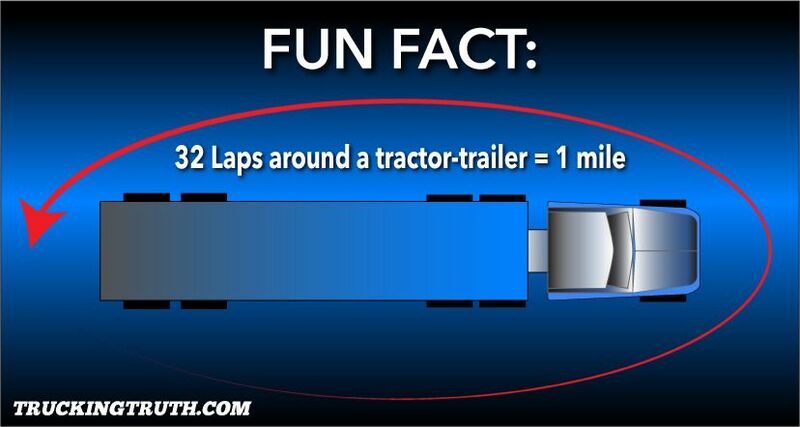 Obviously you will be limited by the amount of space in your truck, but there are plenty of exercises that you will be able to do. Resistance bands are basically just rubber or elastic bands that you either hook to a stationary object, or hold with your feet, and stretching them repeatedly to work your muscles. They are popular because of their affordability, their versatility, and compact size, making them easy to store. They can provide an effective, whole body, workout no matter where you are. For example: Strong Driver Fitness - Fitness Package For The Truck Driver TruckingTruth.com is in no way associated with either of these products and do not necessarily endorse them. Kettlebell exercises are great for busy OTR truck drivers because they combine cardio, flexibility, and strength training into one quick workout routine. In this video, Rob demonstrates some kettlebell exercises for truck drivers to do in their cab when the truck is parked. This beginner kettlebell training routine is simple enough for anyone to do, regardless of experience or skill level. In reality, the schedule of a truck driver is so busy and erratic that finding and using a gym, especially in the first year when most of your time will be spent driving or sleeping, is usually not really feasible for the average OTR driver. Increasingly, truck stops like Pilot Flying J and TravelCenters of America (TA) are adding gyms and fitness centers to their facilities. They'll normally require a monthly membership fee, and may be unreliable in terms of maintenance or upkeep. Many, if not most, of the large and mid-large trucking companies have added gyms or fitness centers to at least some of their terminals. Again, this may be hit or miss according to your normal travel lanes and your schedule. Many companies and insurance plans incentivize fitness and staying healthy, so look around. Traditional chain or franchise gyms, like Gold's Gym or World's Gym, or any place that you would have to travel outside of your normal lifestyle of customer/terminal/truck stop, may not really be all that practical for an OTR driver, especially because of parking. Use Google Maps to check out the parking situation beforehand, and call ahead. Planet Fitness is also a fast-growing chain of fitness centers that is gaining popularity among truck drivers for its reportedly large parking lots. There is really no end to the benefits of regular physical exercise, for both your mind and body. Increased energy, reduced risk for disease, better mental function and mood, and weight loss are just a few of the major benefits of physical activity. Reduced cancer risk: New studies show strong relationship between regular exercise and reduced risk of developing at least 13 different types of cancer. Lowered blood pressure: One of the major health issues common to truck drivers is high blood pressure. Regular exercise is a large part of reducing BP. Strong bones: Regular exercise, specifically weight-bearing exercise like running, walking, and resistance training, helps increase bone mass and keep bones strong. Longer overall lifespan: Doing at least some physical activity, as recommended by WHO, reduces risk of "all-cause" mortality by 30%. Increased Brainpower: Boosts blood flow to the brain, giving it increased nutrients and oxygen. Improves quick-thinking skills. Prevent Mental Decline: Helps stave of Alzheimer's and overall brain degeneration that begins around age 45, boosting the part of the brain responsible for memory and learning. Less Frequent Sickness: Reduces the frequency of colds, flu, and other sickness by jump-starting the immune system. Too MUCH exercise, however, could have the opposite effect on the body. Glowing skin: If you're into that kind of thing, exercise increases increases circulation and nutrient delivery to your skin, helping detoxification. Stress Reducer: Reduces muscle tension, reduces stress hormones in the body, slowing heart rate, lowering blood pressure, and relaxing blood vessels. Better Mood: Reduces symptoms of moderate depression and helps give you a healthier overall mental state. Increases endorphins (hormones in the brain associated with happy, positive feelings.) Recent surveys show physically active people were half as likely to be depressed. Cholesterol: Regular exercise will increase levels of "good cholesterol" in the body.